This year, Luke is a police officer for Halloween. 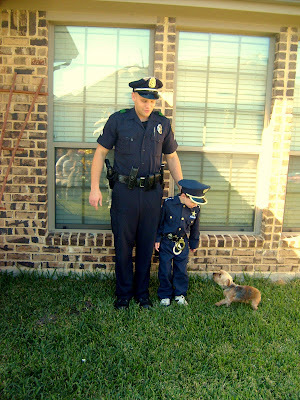 He loves this costume and I know we will get our money’s worth out of it because he will be a police officer as long as he can fit into the clothes. And maybe even a little after he can’t. You can tell he feels like a bona fide officer when wearing his uniform. 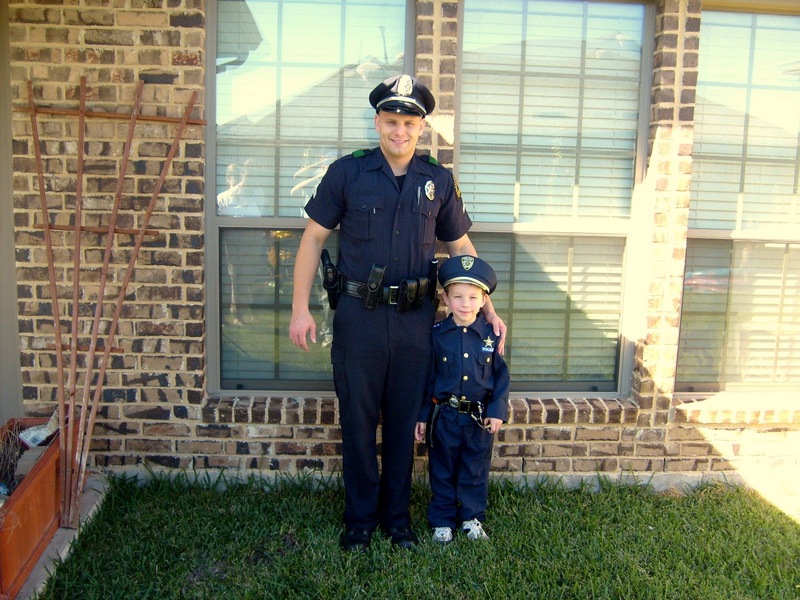 Luke loves our favorite police officer dearly….and the police officer loves him too. It is sweet really. Our officer once gave Luke a sheriff’s badge (with Luke’s name on it) and swore him to uphold the law. That did it, this officer was the coolest….EVER. Luke thinks he hung the moon. He also handcuffed Luke once. That was funny. 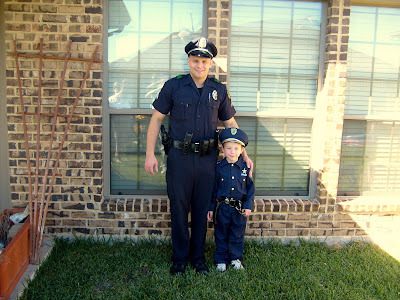 So, really, no surprise that he wants to be just like his favorite policeman. Our favorite officer said that if Luke grew up and was a policeman, he hoped to still be on the force at that time. That would be cool. And, our favorite police officer teaches Luke all kinds of police things. We get the joy of hearing Luke as he enters a room, announces himself, and then checks things out. He knows all kinds of police lingo, thanks to our officer. It cracks me up. I know…. it is hard to tell between Luke and the real officer. Thanks to our favorite police officer for the photo opportunity! The pictures are priceless.